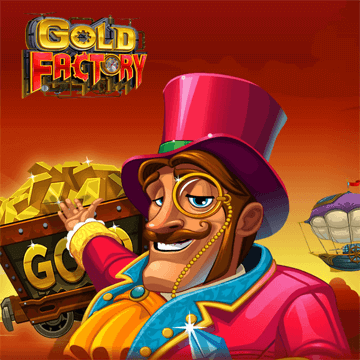 The perfect steampunk-themed slot, Gold Factory offers a 5-reel, 50-payline format with a huge 619,000-coin jackpot and a number of exciting features. With a grand betting range between 0.01 and 100.00, the videoslot offers players a chance to bring home the fortune. Don’t miss the chance! Gold Factory slot offers great winnings through the games Wild and Scatter symbols. As you can easily guess, Wilds substitute for all cards, except for scatters, and with 5 in a row you can scoop 7,500 coins. With symbols such as Trains, Colorful Balloons and Submarines, you can feel the thrill of high paying online slot. During base play, the appearance of 3 of more gold coin Bonus symbols will trigger the slot’s Gold Factory Bonus. This multi-stage slot bonus feature offers extended bonus play that players are unlikely to find on any other slot. If you’re lucky enough to hit 5 Scatters on the reels, you will win prize of 50,000 coins. Free Spins Bonus: After finding the Free Spins symbol, you will trigger between 10 and 35 Free Spins with a 2x multiplier on all wins. The second and third the Bonus levels you can only trigger within The Boiler Room level. However, both you can trigger during one round of The Boiler Room level. If you want to play Gold Factory slot we recommend you to use our free spins or no deposit bonus list with Microgaming Casinos. The slot is available in both, desktop and mobile versions. Play now and enjoy!